Every so often the country is consumed by a news event that just breaks your heart. Orlando seems to be having more than our fair share of these stories. We have lived through the court drama of Casey Anthony and mourned the loss of her innocent daughter. We were in the middle of the national debate of Trayvon Martin and George Zimmerman. My kids go to school across the street from where that happened. Now once again we are in the news for a tragedy that has broken the hearts of people worldwide. I think this story has hit me the hardest of all of them. We are mourning the lives of 49 victims that were taken from this world too early. These were people that were loved and had much more love to give. Read the names and learn more about the victims here. I can't comprehend what drives a person to so much hate that they would go out of their way to hurt anyone. I don't think that any sane person can wrap their head around this kind of hate. I woke up the morning of the shooting to see what happened on the news. This is just a day after Christina Grimmie was shot in front of an Orlando theatre. All I could do was watch the TV and cry for these poor people and their families. The worst part was that some of the families had to wait all day to find out about their loved ones. While I didn't know anyone that was in the club that night, I still take this attack personally. It could have been one of my gay friends or family members. It could have happened anywhere. It could have happened to any of us. It still impacts us all. I have one friend who is a news anchor. Most of us can turn the news off when it becomes too much. She must keep reliving it all day and night as she reports it. I have another friend who works with the medical examiners office. He had to deal with the destruction this man left in his wake. Attending to the lives that are now only remembered as sad thoughts of what could have been. 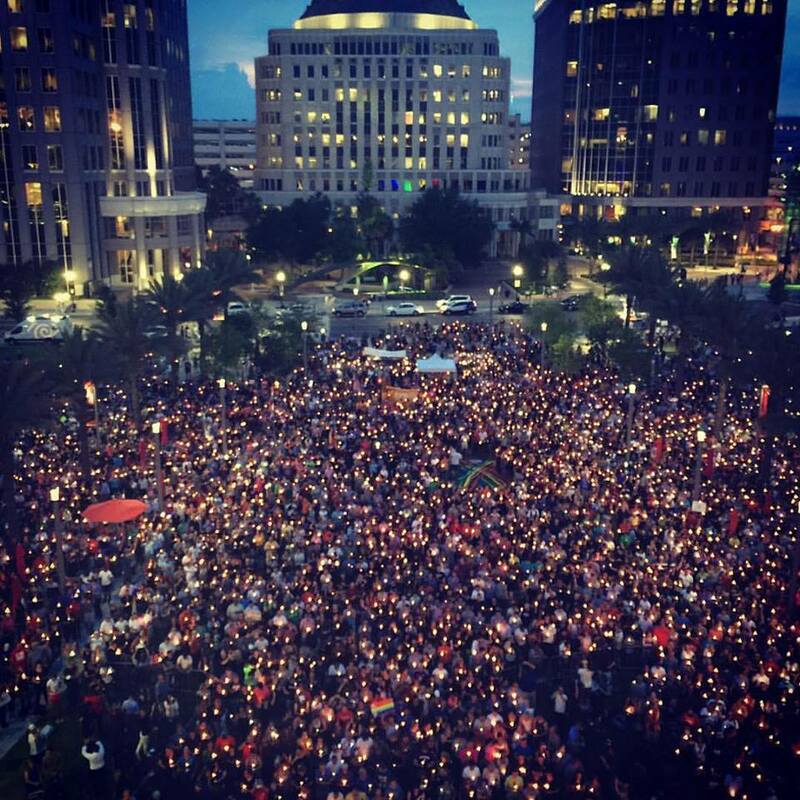 The silver lining of this weekend is to see how the Orlando community has come together in support of each other. People were lined up around the block to give blood. The blood banks had to turn people away as they ran out of collection supplies. Restaurants and individuals donated food, water and ice to volunteers. Churches and counselors have donated services. Orlando City Soccer Club is dedicating their next home to the victims and honoring them in a number of ways. OCSC and the rest of the Central Florida sports teams are teaming up to sell #OrlandoUnited t-shirts and donate the proceeds to OneOrlando.org. The support has not only come from our city, our state, our sports teams, our country, but also world wide. I only hope these pictures of support will help those in pain from their losses. We also need to thank those that were there to help the survivors. The first responders, police officers, doctors, nurses, and the everyday heroes. We will survive and we will thrive. But for now we will mourn our losses and love one another. As I type this, more horrible news in Orlando. A two year old child was dragged into a lake by a gator near the Grand Floridian on Disney property. This city needs a break! We are strong, but come on now! Prayers for this baby and family.